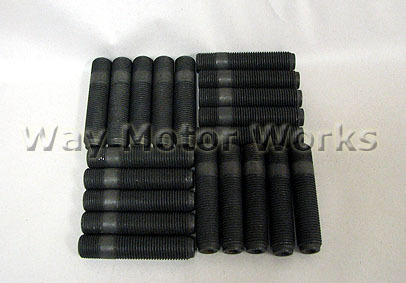 This WMW / TSW 14mm wheel stud kit for F54 F55 F56 F57 MINI from M14x1.25 to M14x1.5. Since the 1.5 thread pitch is so much more common. This increases your options for lug nuts and wheels. Great for those that have trouble with the stock lug bolts, making changing wheels much easier. Made in the USA of premium steel, black oxide finish, bullet nose for easy threading of lug nuts. The wheel studs are 65mm overall length with 52mm protruding from the hub. Works with spacers up to 15mm.